It is time we encourage what is good. God has created everything in balance and harmony, and says the best ones among you are those who preserve harmony by knowing and removing the myths about each other. God rewards for all the good we do, and as a society it is our duty to recognize and appreciate the people who make a difference in the communities we live in. 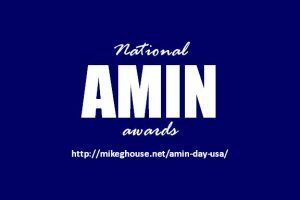 The American Amin Award is being instituted to recognize and encourage individuals who follow the Amin model of the prophet. The first such Awards Night will be held on the weekend of Prophet Muhammad’s (pbuh) birthday, and it would be on Saturday, December 26th 2015; a day after Jesus’ birth celebration. Trust is the glue that binds and ensures smooth running of the societies, and Amin is the foundational value of Islam, the very first step in creating cohesive societies where no one has to live in apprehension or fear of the other. Prophet Muhammad (pbuh) was divinely guided to set up the model of Amin based on principle of cohesive societies. Amin is the one who is trustworthy, tells the truth, has immense patience, who is just, kind and whose presence makes others feel secure. Thus he was called Amin by the Jews, Christians, Pagans and others during his life time. What does this mean for American Muslims? It simply means we have to become Amins of the society, and have to be there for our neighbors in their crises, deaths, marriages, births and other celebrations and commemorations. There are many verses in Quran where God consistently talks about taking care of fellow humans. Here is the bottom line. We need to have comfortable working relationships with everyone from (A-Z) Atheists to Zoroastrians and every one in between including fellow Muslims of different denominations. We should not be dumbfounded when it comes to the right knowledge about others, preferably as they express it and not what is dished out about them. We ought to take pride in knowing all of God’s creation.